This cigar was blended at the Tabacalera La Alianza S.A. and will come in 5 sizes: The Estupendos (5.5 x 52), The Eminentes (5.25 x 44), The Corona Gorda (5.62 x 46), the Hermoso No.4 (5 x 48) and the Dobles (6.12 x 50). The Estupendos should start hitting shelves within the next 2 weeks and all the sizes should be released by March 2013. Prelight: First off, I love the format. I am a sucker for slightly box-pressed cigars. 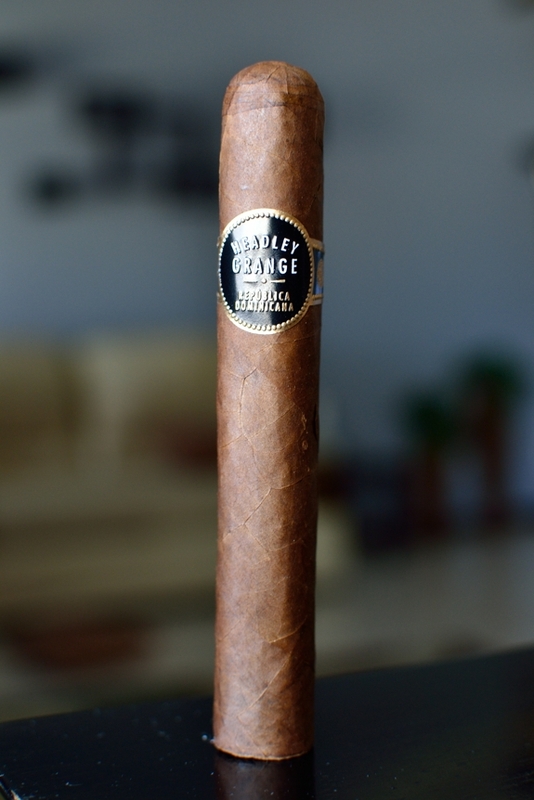 The Headley Grange start off with a very dark brown, silky smooth, oily wrapper. The consistency in color is awesome with only some lighter spots around the few smaller veins that run through the body of the cigar. 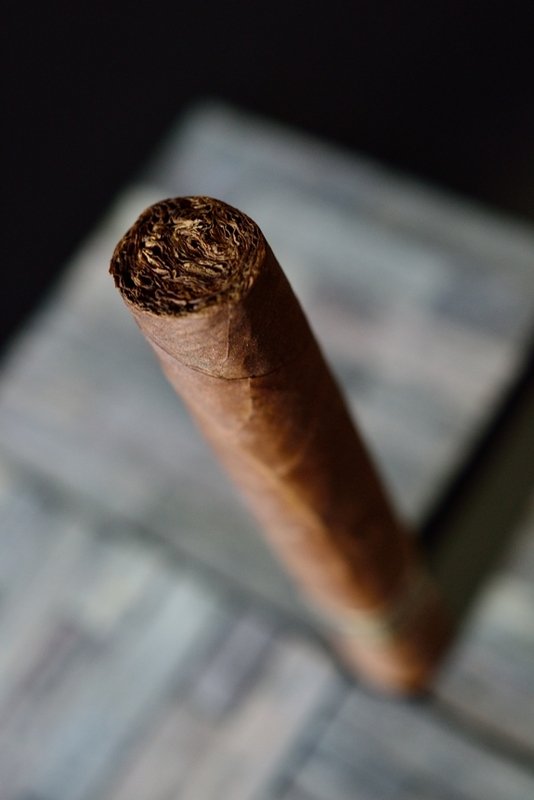 The wrapper seems a bit delicate, and the cigar a bit soft as I squeeze it between my fingers. The Headley Grange is finished off with what looks like a round triple cap. The first one I smoked looked to be double cap while this one looks more like a triple. Either way, construction on this stick is superb. I talked about how much I loved Crowned Head’s Four Kicks band and I feel the exact same with this Headley Grange. Super simple, elegant, black and gold embossed band with the words “Headley Grange” and “Republica Dominicana” printed in the front. I love simple bands, and I love when manufacturers are so confident that the blend will sell itself that they don’t need to get all extravagant with their packaging. The wrapper on the Headley Grange gives off very little in the aroma category. All I really pick up is some sweet tobacco and slight cedar while the foot of the cigar has a more pronounced tobacco and spice aroma. The cap cut like butter using my double bladed Palio cutter. The cold draw seemed very loose while it kicked out some nice spice, cedar, chocolate, and natural tobacco flavors. First Smoke: Boy was I wrong in thinking this Headley Grange was going to have a loose draw. Each tiny, little puff filled my mouth with a massive amount of thick, white smoke. I love it when a cigar experience is this responsive. 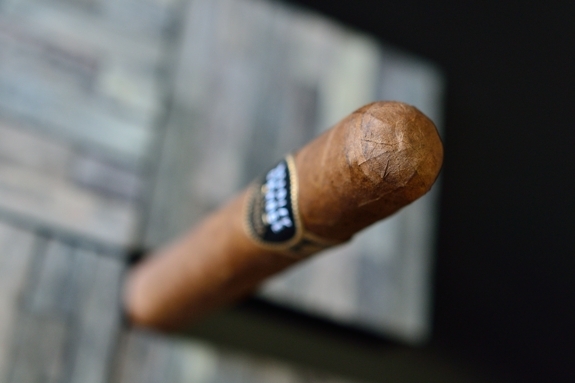 The cigar started off with just a very slight fit of black pepper before it faded into a much more sweeter experience with lots of sweet tobacco, tons of cedar and earthy flavors with a bit of caramel and coffee. The burnline is razor sharp and slightly wavy, but nothing too concerning. The ash left behind is a compacted, bright white and light grey which held on for a little over an inch before giving way. Halfway There: Strangely enough, the black pepper made a few brief re-appearance into the second third of this Headley Grange. Usually when cigars have small traces of black pepper they tend to lead off with it, and then it’s gone for the remainder of the experience. This re-appearance adds some nice character to the Headley Grange’s profile as the second third flavors are much of the same cedar, and sweet tobacco with a ramp up in the caramel and coffee and even a bit of soft cream, like vanilla or milk or something. Speaking of cream, this cigar is very smooth and creamy. Even the retrohale is soft as it coated my nasal passage with nothing more than cream and cedar. I am not feeling any nicotine as I polish off the second third and the burnline has complete corrected itself and is now rockin’ perfectly even. Finish: The body has really started to ramp in into the final third of this Headley Grange. The pepper is back yet again, blending in awesomely with the huge ramp-up in spice and cedar. 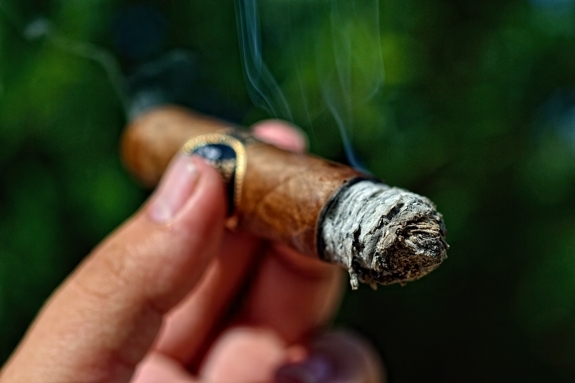 Along with the spice, cedar, and pepper the cigar is still carrying it’s caramel, cream, and coffee flavors as the more natural tobacco flavors are taking a back burner. Even though the body has really ramped up, the Headley Grange is keeping true to it’s creamy/smooth form. 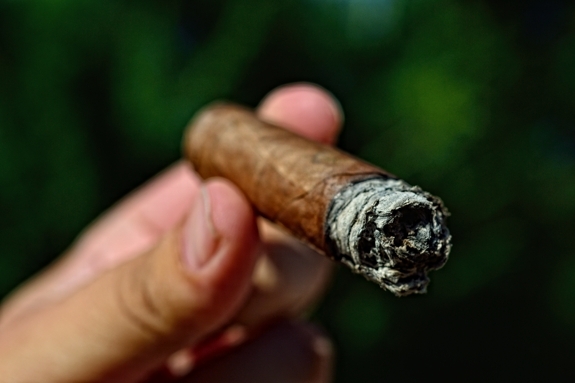 I didn’t have to touch up or relight the cigar the entire hour and a half it took to smoke it. The Headley Grange left me with only a slight nicotine kick. Overview: I swear EP Carrillo must have magical hands. Everything this man touches turns to gold and the Headley Grange is a perfect example of that. Again, you pair a blending genius like Carrillo with Huber’s attention to detail, great ideas, and strong spirit and only great things can happen. 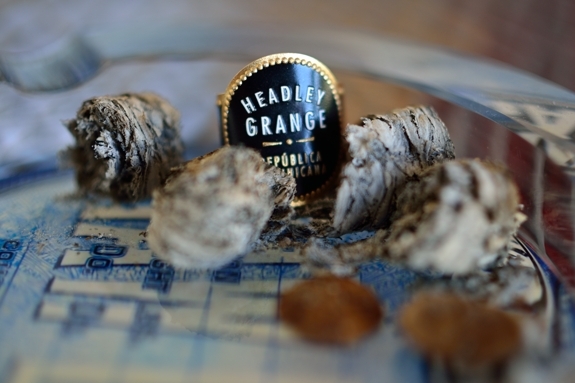 I personally thought the Four Kicks was a great blend and the Headley Grange is a great addition to the Crowned Heads portfolio. The cigar is VERY flavorful while remaining balanced, creamy, smooth, and subtle in the strength department. I really enjoyed the crazy ramp-up in body during the final third of this cigar. This cigar is very box worthy. I don’t think I need to tell you to pick a few up once they start hitting retailer’s shelves. Not only is the complexity perfect for the seasoned cigar smoker but this is a perfect cigar for a novice that really wants to try something is a bolder, more flavorful category. Huber, we’re watching you, and expecting great things from you. Thanks for not letting us down! 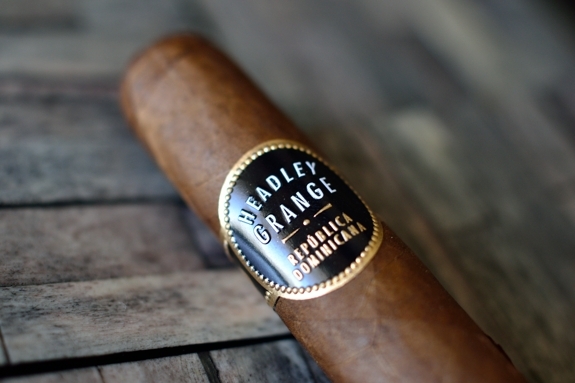 Pairing: One of the most dominant flavors in the Headley Grange’s flavor profile was caramel. Knowing this, I sprung for a brew style that carries much of the same caramel profile, a Marzen. This Marzen in particular is Samuel Adams’ Octoberfest. I love German beer. They are probably my second beer of choice after Belgian so naturally I am a fan of Marzens. Samuel Adams actually does a bang up job in terms of creating a good, inexpensive, seasonal, German-style Marzen. Considering I can find these at less that a dollar a pop it’s a given that I find myself loading up on them as fall rolls around. This 5.3% ABV beer is brewed a the infamous Boston Beer Company and is usually available between late August and early November. The Octoberfest pours a beautiful orange in color as it showcases it’s smooth flavors with tons of caramel, sweet malt, citrus, and spice. Tell me it’s not a perfect match for the flavors contained in the Headley Grange! The two complimented each other extremely well and the beer actually assisted the smoking experience by adding and amplifying the spice in the cigar. thanks for the review!! sounds like a cigar to be had ! Good work from good people! I too am crossing my fingers in hope that hockey gets played this year. Cant wait for these! Nice review. They are worth the wait! Great write up, as usual. Definitely another one for the “to get” list. Thanks JJO! This should be on that list for sure. Tony – Just wanted to say ‘thanks’ for taking the time to check out Headley Grange…very happy you enjoyed. Thanks for the read and for putting out great products man. I really do appreciate all the work and attention to detail you have always put toward your brands and product. Keep it up man. So glad to hear these are good. 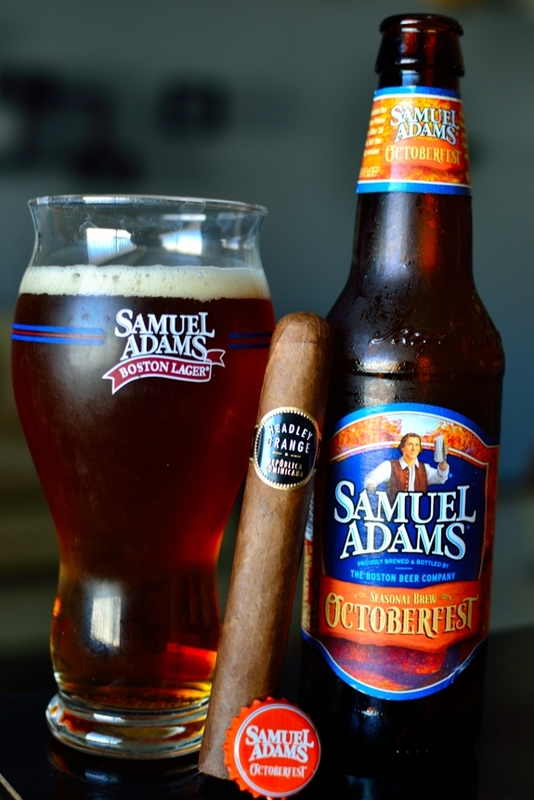 I’ve been hearing all about them, and it just seems to be one of those cigars that you want to like so bad, and for once, it seems like I will enjoy them. Love the bands too! Very classy. Exactly! Both blends from the Crowned Heads were like that. I hoped to like them, wanted to like them, love the people behind them, and for once, neither of the two let me down. Gotta love that. So glad to hear these are good. I’ve been hearing all about them, and it just seems to be one of those cigars that you want to like so bad even before you smoke one, and for once, it seems like I will enjoy them. Love the bands too! Very classy. Excellent review and pics, I cannot wait to try it out, gracias Tony. 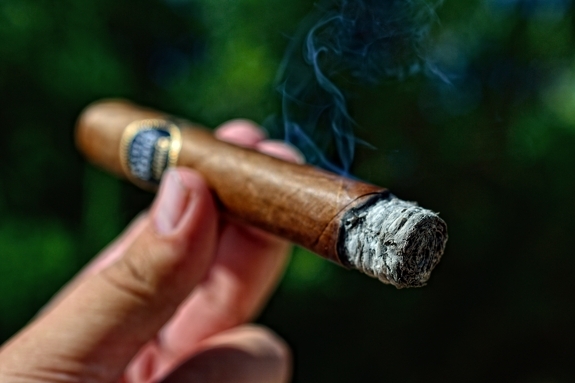 Hay Tony, sounds like you like this cigar, good review as always and great photo’s. This sounds like I might like it also.